The Hobbywing X-Rotor Pro series ESC deliver class leading performance in terms of efficiency and reliability, making them our first choice ESC for professional applications. This particular 40A Pro version is suited to large industrial application multirotors. It's rated at 80amps (100amp burst) and supports 6S to 14S (22.2v - 51.8v) operation. 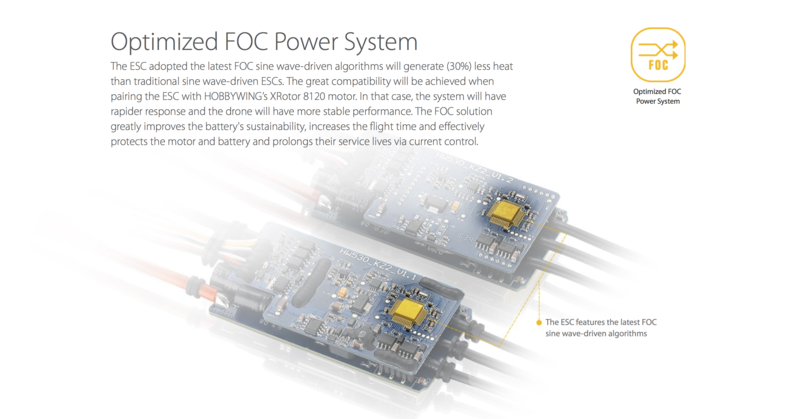 As with all of the X-Rotor ESCs, the 80A V3 has been designed specifically for multirotor use. With their special core program tuned for multirotors, the ESCs have been optimised for compatibility with disc type outrunner brushless motors, which are commonly used on large multirotors. A unique feature of the series is the Driving Efficiency Optimization (DEO) function. This significantly improves throttle linearity and driving efficiency, by automatically braking and quickly reducing the motor speed when decreasing the throttle amount. The effect is increased manoeuvrability and stability of your multi-rotor, with the bonus of improved efficiency too. The high performance of the drive chip is enhanced further by the use of extra low-resistance MOSFETs that also allow high currents to be held stable for longer. The ESCs come with long power and signal wires as standard, which means they can be installed without extensions on even the largest of frames.